We beginnen meteen bij de hoofdingang, waar één van de allernieuwste aanwinsten in de collectie van het museum is tentoongesteld. De collectie van het NHM bestaat uit zo'n 400.000 mineralen- en gesteentemonsters. Dit bijzondere stuk gesteente, door het mijnbedrijf Rio Tinto geschonken, is afkomstig uit één van haar mijnen in het gebied van de Eastern Guruma in de Pilbara Regio in het noordwesten van Australië. The coloured bands in this rock reveal a dramatic increase in atmospheric oxygen, a critical moment for the evolution of life on Earth. More than 3 billion years ago, bacteria in our planet’s young oceans began to produce oxygen through photosynthesis. This oxygen combined with dissolved iron in the sea to form insoluble iron oxide, which separated out of the water and sank to the seafloor. As it settled, bands of red and grey iron-oxide developed between layers of silica-rich sediment. 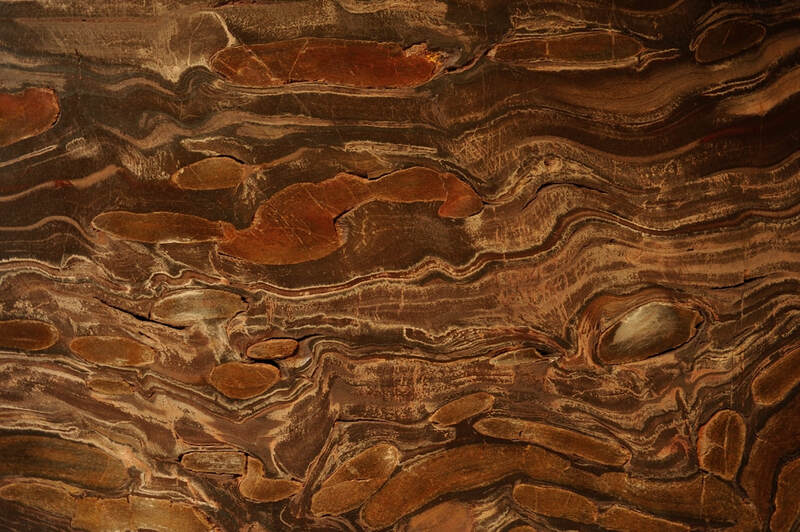 The intricate and dramatic layers in this rock signal a turning point in Earth’s history: the Great Oxygenation Event. This led to an increased diversitiy of life forms and the appearance of new minerals. The NHM’s collection of more than 400,000 mineral and rock specimens is used to study the development of our planet. Western Australia, ca 2.6 billion years old (AQ-PEG-2016-33). This rock was donated by Rio Tinto and came from the traditional lands of the Eastern Guruma People in the Pilbara region of Australia.